What is it about optimizing your online sales funnel that seems so nebulous and challenging for marketers today? Not even sure what I mean when I say, “Online sales funnel”? Then you’re in the right spot. Stay tuned to learn about it from an expert! 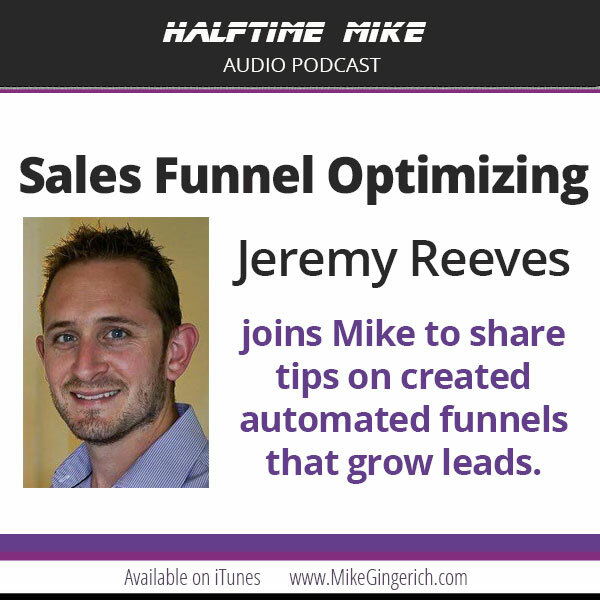 In this episode of the halftime Mike podcast I interview online sale funnel specialist Jeremy Reeves. Jeremy is one of the top sales funnel experts in the world today. He’s trusted to build funnels for Crazyegg.com computer products and dozens of other Inc. 500 companies. Jeremy hails from Pennsylvania and is busy online all the time with sales funnel products for copy writing, coaching, and providing direct services. I’m excited to dive into the details of powerful sales funnels today! Jeremy started as a copywriter. Copy is important in sales funnels! He uses writing as a strategic tool that help clients sell better. He emphasizes his key to writing as always something that should bring value to his customers. To be successful on this, one needs to focus who is the customer. Jeremy has a degree in Psychology. He was able to use this background to help him know with ease how people feel, what people think and what resonates on the customer’s level of emotional feeling… like what are their frustrations, etc. Out of these, he then comes up with ways to help them. Sales Funnels are a means of sequentially walking your soon-to-be customers through a strategic, automated process in your marketing t. Jeremy creates and pulls copy writing content and puts it into automatic sequences: email, rewriting on website or an automatic webinar. Together,these are his strategic mix. Why is a Sales funnel important to websites today? More Sales. A Sales funnel comes down to timing. It doesn’t work in an instant. Most people are not ready to buy at the first moment of introduction. It is a step by step process of building relationship with your customers by letting them know about you in the process, and winning their trust before they do business with you. Sharing with them personal stories, making them see that you understand their frustrations and that you can relate to them. As you help them with their concerns, as a way of giving them value, you can share to them mini parts of your successes and show them how and why what you are doing works – Here you can already insert little pitch of sales into them. Let them see what makes you better than your competitors and why you are the right person they need to solve their problem. Pat has a 7-figure Personal Training business. He was selling 3 uniquely different products to his audiences. Jeremy’s solution was to segment his email list based on unique factors. Dustin – The method used was to direct Facebook ads to a landing page, leading to a webinar, for this network marketing business. They offered a free bonus webinar, a 2k training course, phone and sales support. He only has to pay $7 per leads, but averages a $57 return on each! Melissa – She was doing lots of launches per year, making in labor intensive and tiresome. Jeremy did worked with her to create an automated webinar system that runs traffic to it earning $1,300 a day without Melissa talking to anybody about anything. Awesomeness! Listen to the full stories of each! 4. What are common gaps and mistakes you see in Sales Funnels online? People tend to wait for too long to launch. Don’t wait for the perfect time and perfect things before moving or starting something. Nothing gets done with that! Get to 80% and launch. Know your audience! You can’t “scatter shot.” You need to know who you are reaching and how you can best connect on a emotional level with them. One also needs to answer the question: How can I prove to them that I am the best choice for them? Be aware of these things while you’re looking for Sales Funnels. 5. What are some “Growth Hack” tips you might be able to share that can help our audience? There are different structures for different types of Sales Funnels. Different factors and steps depending on what kind of product you are selling. Jeremy usually does Mind Mapping of a sales funnel when working with a client on a plan. Drawing it out visualizes the process and end-game. Remember….The Customer is the main epicenter of your business. Anything you will do needs to revolve around them. You need to understand your customers. Make sure that what you know about your customers is being expressed and articulated in your copy. Freedom offer concept – Consider a way to give your clients 5x or 10x the quality of your service than your highest listed price. Yes, go big! How can you offer a exclusive, elevated Freedom Offer premium version of your product or service? You only need 1-3 to act on this to really launch your business forward. What is your market positioning? Maybe you’re on the low end of cost, middle or high classification. Improve your positioning! Know where you stand in the market. The most critical position to be in is to be in the Middle group. Since all types of competition is here, you need to stand out and know what’s different about you. Next, understand your types of customers. Do analysis. Who is giving me revenues for the least amount of stress? Doing Segmentation will help you identify this and eventually gives you the most accurate marketing strategy you can offer your client knowing where they are coming from, where they stand, and where they want their business to go. All this and more in this podcast episode! So what’s your key takeaway from this? What do you need to do in the next 24 hours based on listening?